Spray 5- to 6-quart slow cooker with cooking spray. Place onion in slow cooker. In 12-inch skillet, heat oil over medium-high heat. Sprinkle pork with salt and 1/2 teaspoon pepper. Cook pork in oil about 10 minutes, turning frequently, until brown on all sides. Place pork over onion in slow cooker. In small bowl, mix cider and honey. Pour around pork. Cover; cook on Low heat setting 8 to 9 hours. Remove pork from slow cooker to cutting board; let stand 5 minutes. Shred pork into chunks, using 2 forks. Skim fat from cooking liquid in slow cooker. In small bowl, mix cornstarch and water; stir into cooking liquid. Increase heat setting to High. Cook 1 to 2 minutes, stirring constantly, until gravy is thickened. Heat mashed potatoes as directed on package. 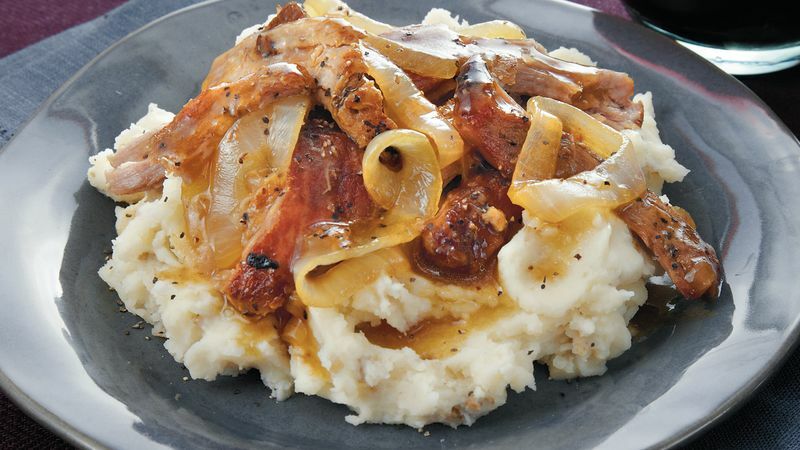 Serve pork with mashed potatoes and gravy. Sprinkle with additional pepper.